The evolution of indoor plumbing had a slow start. It first began in the 1840s, but a century later only about half the homes in America had piped hot water, tubs, showers, and a flush toilet. Since then, plumbing technology has picked up the pace with progressively more sophisticated fixtures, pipe, and joint materials and water heating systems. One of the last areas to benefit from modern technology has been the sewer line that carries waste out of the house and into the municipal sewer. Many of these waste pipes are made from concrete, clay or cast iron and have been in the ground for decades. Trenchless sewer repair is a modern upgrade to a critical part of your home plumbing system and one that can provide considerable benefits – even if your sewer line isn’t currently having issues. 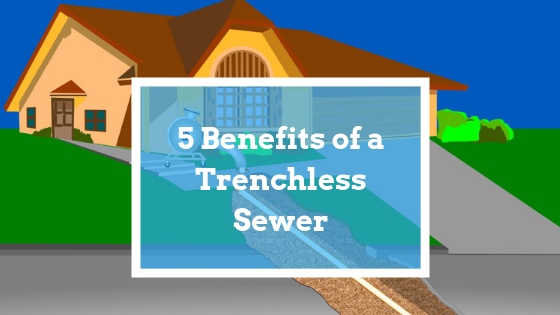 What is a Trenchless Sewer? Trenchless sewer technology simply uses your existing sewer line to blow or pull into place a cure-in-place liner inside the existing pipe. It is seamless and made of either polyethylene or epoxy resin. Another method is to drive a new line down through the existing pipe in such a way as to burst the old line by expanding it. Both methods have worked well for several decades. It is fair to say that your sewer line is a ticking time bomb. Traditional pipe materials are being broken down by earth chemistry and roots seeking nutrients in the waste water. Earth tremors, road vibrations and nearby ground work can add to the demise by causing pipes to vibrate and shift and eventually pipe joints fracture or crack. When roots get into the line and cause clogs, they can be removed, but eventually, they return. When roots have breached the pipe, it is an indication that your waste line is damaged, probably in multiple places, and is likely to fail in the not-too-distant future. If you do nothing, you risk having a collapsed line and the need for extensive sewer repair. Trenchless sewer materials replace materials that are efficient but cannot ultimately resist the elements. These new materials are designed to last at least a half century! That’s far longer than any other part of your plumbing system. It used to be that if your sewer line had to be repaired, the entire incline had to be dug up and replaced. This required a great deal of labor, machines and time, and so it was the largest expense your plumbing system could incur – running up as high as $60,000 or more when street excavation is required. On top of that, there would be necessary damage to your landscaping and any plants, asphalt or concrete that lay in the path of the sewer line. Trenchless sewer specialized repair leaves your lawn intact. The advanced technology requires only one or two small holes rather than creating a huge impact on your property. You save on labor and also on landscaping repair afterwards. Depending on the length and depth of the sewer line and if excavation extends into the street, traditional sewer repair can take many days, even weeks, and require partial road closures and permit fees. During this time, your indoor plumbing may be frequently unavailable for use. Trenchless repair can often be completed in two days or less and the cleanup is fast, with minimal landscape repair necessary. The labor cost for traditional repair can be more than 10 times that of trenchless. For short runs that are fairly shallow and no landscaping issues, traditional repair may actually be cheaper up front, but it typically won’t last nearly as long as the newer technology. The cured in place pipe (CIPP) is flexible and smooth with fewer obstruction or textures that can catch and retain waste. Because of this, the flow is faster through the line and you may experience stronger flushes requiring less water. A well-barriered waste pipe will not attract tree roots. Instead, the roots sink deeper into the ground, hold the soil together better and linking the trees and bushes to more reliable ground water. When a sewer line needs to be repaired, the details of the situation can vary. How deep is the pipe and how great is the damage? What kind of soil is under your lawn? Sandy? Rocky? Loamy? Pipe lining (CIPP) involves making the materials on-site and then running the resin through liners that are inserted in your existing sewer line. As it cures, it bonds to the inside of the existing pipe. There are two advantages to this process. It creates no significant ground movement when being put in place and it can be performed in any soil type. It will work on any line materials even including the clay pipes that are common in many home sewer lines. Pipe bursting involves special equipment and the digging of a sizable pit to fit it. It still requires far less excavation than using traditional methods. However, it uses considerable percussive forces that often results in significant ground movement. For this reason, its use in sandy or rocky soils must be carefully assessed before choosing this method. The equipment involves running a new pipe down the same line as the old pipe but with a heavy pipe bursting head in the front. This head breaks the rigid old pipe by expanding it beyond its ability to hold together and then threads the new pipe into the existing channel. Both of these technologies have been in use since the 1980’s and have proven to save a great deal of money and inconvenience for the homeowner. While neither procedure is cheap, they both offer a lasting result that improves the overall performance of your plumbing system without the clogs from roots and sediment in the future. This article is intended to provide a general overview of this modern technology. If you have concerns about your sewer line or you’ve been told it needs to be excavated and replaced, Benjamin Franklin Plumbing strongly advises you to call us out for a free inspection and consultation. The length of your line, its present condition, your related plumbing issues, the age of the house and several other factors should to be taken into account to determine what solution will provide the optimal outcome. Is Drain Cleaner Truly Bad for Your Pipes? Brooks has been to my house on a couple of occasions. Timely, professional, great service. kim handles the appointments in a very timely fashion. Highly recommend! Carly was professional and treated me like an old friend when we spoke. She helped me diagnosis my problems over the telephone and request the required service to clear my problem. Carly scheduled my service and kept me apprised of the arrival time of my plumber. Nick arrived by 4PM. Carly was professional and treated me like an old friend when we spoke. She helped me diagnosis my problems over the telephone and request the required service to clear my problem. Carly scheduled my service and kept me apprised of the arrival time of my plumber. Nick arrived by 4PM. He was professional and pleasant. He treated both me and my home with respect. He inspected the situation, and kept me advised of solution. He completed the necessary repairs, tested the systems, cleaned up [taking the broken parts] and left about 5 PM. He did not HURRY, though he worked efficiently. I am pleased with the quality and care of the customer service I received from this team. © Benjamin Franklin Plumbing, Inc.